"Because there is something strange, fascinating and common amongst these three types of people. To understand one of them opens a window of understanding into all of them. They tend to have a level of confidence and bravado that far outweigh their actual abilities. This is not an insult. It is in fact a compliment because this extreme level of confidence often enables them to overcome insurmountable odds and obstacles. From defeating enemies in wars, to breaking the sound barrier, to creating products of awe and wonder; their unwavering faith and vision give us a far more interesting and exciting world. Making the impossible possible, the unfathomable fathomable, the unwinnable winnable. It is what makes us follow them, reject them, love them, hate them, envy them, and ultimately wish we could be them. This book is more about entrepreneurs than it is about president or pilots. While we often adore and look up to presidents and pilots, we view entrepreneurs as strange and outside the norm. That is until they hit it big. Then we call them geniuses! Nevertheless, the same admirable characteristics we see in president and pilots exist in larger amounts in entrepreneurs. 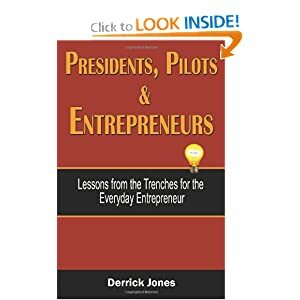 Therefore, as fascinating and admirable as great presidents and great pilots are, entrepreneurs have a little something extra that place them in a class all their own..."